Firstly, I was drawn to this book because I liked its title. 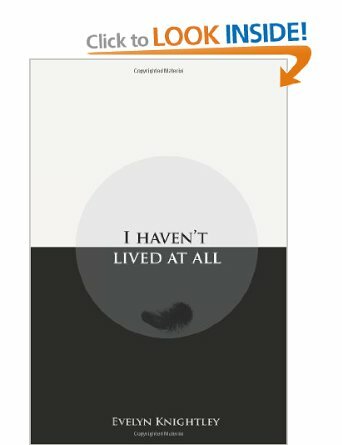 "I Have'nt Lived At All" is a thought that can come to any one of us, whatever age we are. You can think it when just concentrating on your own life or comparing it with that of others. What it means to actually live is another matter. This is Evelyn Knightley's first published book. Still in her early twenties, she writes through her collection of verse and prose in a clear, direct way. All of the best tales and poems that have survived have been written in a clear, direct way, with an awareness that the words are meant to be understood and appreciated by the reader and not just by the author alone. The book is divided into two parts. Part One is a collection of poetry, Part Two is a collection of short stories. In both the poems and the short stories, the narrator is conscious of her own aloneness and separation from the world, but, thankfully, without self pity or despair. 'On The Moon', the first poem sets the tone for the entire collection of writings. While the narrator of the poem felt so isolated that she 'lived on the moon', she wonders if the person her verses are addressed to ever knew she was there at all. It is a short book that deserves a long think about. There are poems about memories, of seeing clowns as a child in a circus, of people who the author was frustrated by and lost patience with, who she tried to help, save, and there are meditations on time, its passing, and the knowledge that the best is yet to come. Of the short stories in Part Two, I was moved most by one called 'Work In Progress'. On the surface, it is an account of what it is like for a young woman to work as a barmaid in a country village pub, one who is weary of her daily routine, who does not want to be there, but elsewhere. Underneath, it reveals what it is like to feel not part of, not one with those who life has led you to have to deal with, to feel trapped, with no door in the distance, to escape through. At times, the narrator of the poems and short stories reminded me of a character in a novel by Franz Kafka, being very aware of and involved in what is called everyday life, but utterly isolated and separate from it at the same time. When someone knocks on the door in the short story, called 'Ending Seasons', for example, it is as disturbing for the reader as much as it is for the narrator of the tale. For more than just outside, on the other side of the door, the visitor seems to be in another world from the narrator altogether. Death, freedom, escape, disconnectedness, time, memory, love, rejection, hope, such are some of the themes of the writings in this book, which is well worth the read and the thinking over. I liked the false ending to the book. After the About the Author page, which would usually be at the end of the book, there is a final short story, aptly called 'Disconnected', which acts like an encore at the end of a concert. Then the end finally comes with 'Soundtrack', being a list of some of the songs the author listened to while she was writing her book. Now, her first book published, she stands on the shore, what ocean lies before her is up to her to imagine.